Good morning Lovely!!! I couldn't wait any longer to show you this adorable image from Faery Ink!! This is Fable and Tweets!! And she is available over at Faery Ink for 24 hours for FREE!! Go get her!! She is too adorable not to play with!! Such a fun little project to do and I am loving this card style!! And there you have it! I can't wait to see what you do with this adorable "Fable and Tweets" digi once you go get it! Now off you go! Fill your world with beauty! Wonderful project! 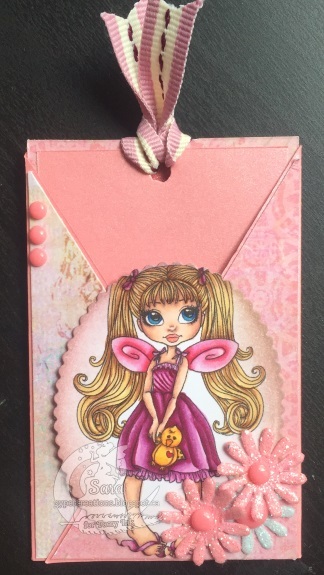 I love cards with surprises like yours, and the beautiful fairy is wonderful! So cute, love the pinks with a pop of purple!